John W. Clark passed away on August 6, in Houston, Texas. He was a professor of Engineering at Rice University for 49 years. When I was a graduate student at Vanderbilt University in the 1980s, I was influenced by the papers of Robert Plonsey and his graduate student Clark. They calculated the extracellular electrical potential outside a nerve axon from the transmembrane action potential by expressing the transmembrane potential in terms of its Fourier transform, and then using Bessel functions to calculate the Fourier transform of the extracellular potential. Russ Hobbie and I outline this technique in Problem 30 of Chapter 7 in Intermediate Physics for Medicine and Biology. James Woolsey, my PhD advisor John Wikswo, and I used a similar method—inspired by Clark and Plonsey’s work—to calculate the magnetic field of a nerve axon (see Problem 16 of Chapter 8 in IPMB). Moreover, my first work on the bidomain model of the heart was analyzing cylindrical strands of cardiac tissue using methods that were an extension of Clark and Plonsey’s work. 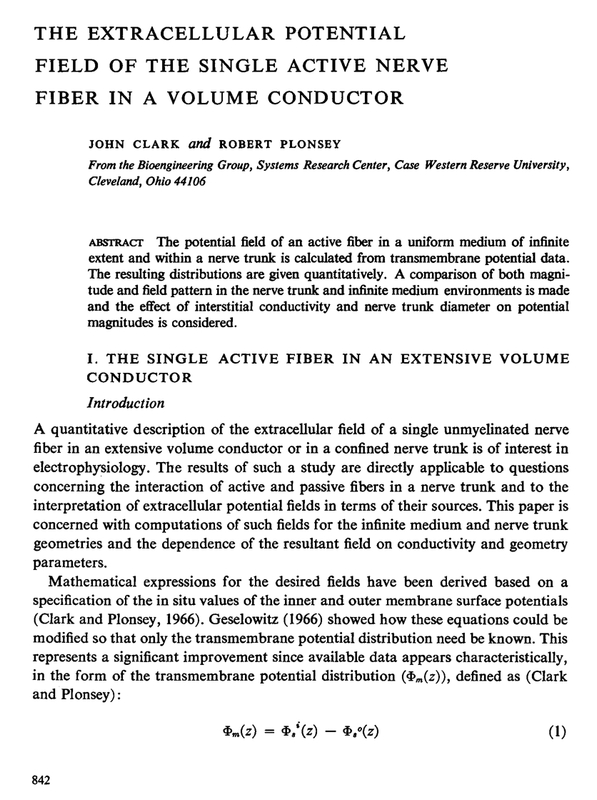 If I were to list the articles that had the biggest impact on my own work, near the top of that list would be Clark and Plonsey’s 1968 paper in the Biophysical Journal (Volume 8, Pages 842-864). Clark graduated from Case Western Reserve University at about the time this Biophysical Journal paper was published, and joined the faculty at Rice. Rarely do you see a professor’s career span half a century at one institution. He was a Life Fellow of the Institute of Electrical and Electronics Engineers (IEEE) “for contributions to modeling in electrophysiology, and cardiopulmonary systems.” He played a role in establishing the field of biomedical engineering, and served as President of the IEEE Engineering in Medicine and Biology Society. To learn more about Clark and his contributions, see obituaries here, here and here.